In the modern flooring market, many popular manufacturers are encouraging their customers to “go green.” But what does going green mean? It means saving time and money on your flooring while saving environment from the effects of pollution and waste of resources! Now Montana Flooring Liquidators offers all of the latest green flooring options for the home to residents in Billings. You can have all-new green floors installed in your home fast and at an affordable price. 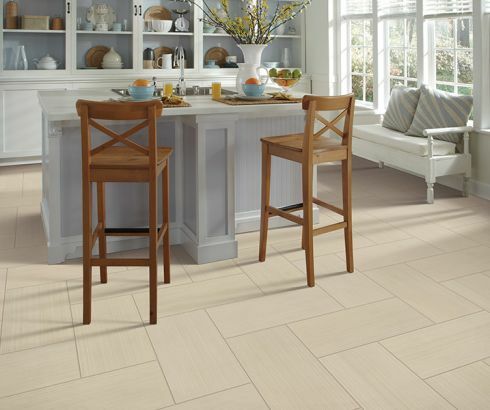 We carry popular options like cork, bamboo, linoleum and tile. Read on to learn more about some of the amazing green products that we carry. Bamboo: Bamboo is actually a type of grass rather than a type of wood. But this hardwood substitute is becoming popular because of its unique beauty and sustainable nature. It is durable and more resistant to moisture than hardwood. Cork: Cork, like bamboo, is often suggested as an alternative to traditional hardwood. It is harvested from living Cork Oak tree bark and is durable. It can be stained to match your decor. It offers sound reduction and better insulation for your home, which can lower energy bills during the summers and winters. Tile: Tile is familiar to most homeowners. It can be found in ceramic, porcelain, and natural stone forms. It is a beautiful and natural option for any home. It is water and flame resistant, so tile can be placed in bathrooms and kitchens. Tile even works in outdoor spaces because it will not fade in sunlight or warp after rain! Reclaimed wood: Reclaimed wood prevents deforestation by using old hardwood instead of newly harvested lumber. It has a charming weathered look, but can be sanded and refinished if the homeowner wants a “newer” look. It is generally cheaper than new hardwood and has most of the same benefits. Linoleum: Linoleum may seem entirely man-made, but it is actually made up of a combination of natural ingredients. Some of these ingredients include cork flour, linseed oil, sawdust, and pine resin. It is biodegradable, easy to maintain, and lasts for decades when properly cared for. Terrazzo: This may be a new name to homeowners, but it is made of familiar products. Terrazzo can be a mix of concrete and marble, stone, or glass. It can also be manufactured out of recycled materials. Although it is pricier than other green products, it has the highest durability and can stand up to years of heavy use. All green products sold at Montana Flooring Liquidators are sourced responsibly and tested for quality. Find out more about our green flooring and installation services online or at one of our locations in Billings. Begin shopping today and find affordable rates on everything you need to improve your home and “go green”!